Chop the chicken into 3cm pieces. Heat the olive oil in a large pan, add the onions and cook for 8–10 minutes until soft. Add the garlic, chilli and ginger and cook for 2 minutes, then stir in the tikka paste, chicken and tomatoes and gently simmer for 10 minutes. Meanwhile, mix the mint and coriander with 50g yogurt and season. Stir the remaining yogurt into the curry and heat through, then remove from the heat and stir in the lime juice. 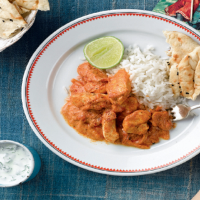 Serve immediately with the mint and coriander chutney, naan and plain rice.